There are several brokerage house offering assistance when you wish to open a demat account. One such is Angel Broking which is a reputed, most preferred and well-managed stock broking company in this field. For top-notch investment solutions and dedicated customers service, this company is the gateway to financial marketing. Opening the demat account can be a challenging task but by following some tricks and tips, you will be able to go through it easily. Nothing can be better than storing shares and securities within the electronic database which is known as a Demat account. This is also known as a decentralized account that is required during online trading. In this way, trading with shares becomes an easy affair. Why choose Angel Broking Demat account service? 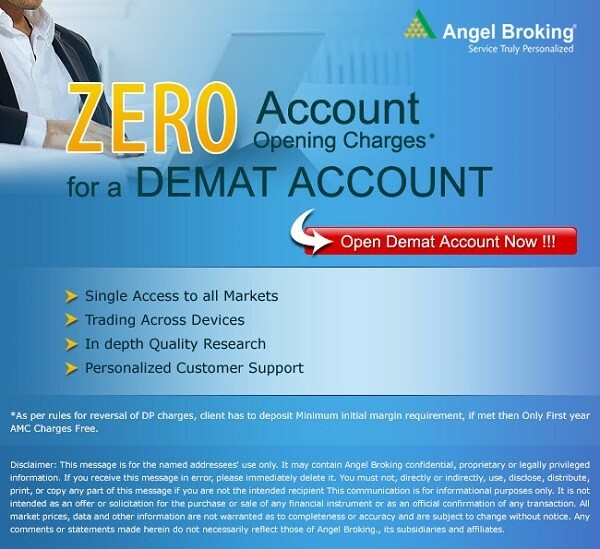 The opening demat account can become an effortless task when you seek service from Angel Broking brokerage firm. It hardly takes any time to open the account and you can start trading within an hour. Alluring discounts on opening demat account makes it easy on the pockets. Other than these, the brokerage firm offers more than one reason to choose over others and some of them are detailed in the following part of the article. · Excellent network - The excellent network of sub-brokers and employees makes it possible to deal with almost millions of investors that will help you to achieve financial prosperity easily. · Service and market knowledge - It offers an excellent combination of top-level service, deployment of top-notch technology, and the market knowledge helps in handling the single trading account easily. With the help of this account, it enables you to deal with more than one asset class such as equity, mutual funds, derivatives and others. · Use of technology - You can get seamless trading experience with the help of latest technology methods that have been deployed in this trading platform. Both desktop application and mobile application have been launched for the ease of online trading that can be done from any place. · Easy to use the trading platform - A user-friendly trading environment is provided. For individual investors, specially designed assistance is available in this brokerage for effective asset allocation. · Investment ideas - An instant portfolio check is available via the mobile application following which you can get investment ideas. · Open trading account easily - With the help of biometric data accessing method, the trading account can be opened in just an hour. Several flexible brokerage plans are offered by this firm for easy accessibility. Also Read: The Debts are Piling Up – What are the Reasons Behind it? · Easy accessibility of shares – Investors can transfer holdings by getting a delivery instruction receipt while buying or selling shares. The details of the transaction will be provided in the receipt and it should be preserved for future use. · Multiple accessibility options – Due to the electronic accessibility of Angel broking demat account, it is possible to access it from any electronic medium. It can be a smart phone, desktop or other devices. · Fast e-facilities – With the help of National Securities Depository Limited, instruction slips can be sent without much hassle and making the process an easy one. · Corporate benefits – Some corporate actions such as right shares, bonus and others are automatically added to the demat account. · Easy loan facilities – Account holders can get loans against securities which in turn can be used to avail different loan facilities. · Fast access to the securities – The depository participant can help Demat account holders to convert physical certificates into its electronic version. The electronic securities are more secured compared to physical securities. If you are new in the stock market and planning to Angel broking demat account, this firm makes it possible to rely on them. Stock advisory team and the in-depth research on the stock market will help you to trade seamlessly and gain profit. Therefore, when using the demat account, the securities can be maintained in either physical form or electronic form as investors can use either of them. It is also seen that it is difficult to sell or buy the securities in the physical form. Thus, demat accounts are simple, extremely beneficial, and hassle-free and a must for effective financial planning. You can open your demat account by clicking here. Hello, its very good post for property and easy to understand your blog.